(The Holy House of Loreto). Since the fifteenth century, and possibly even earlier, the "Holy House" of Loreto has been numbered among the most famous shrines of Italy. Loreto is a small town a few miles south of Ancona and near the sea. Its most conspicuous building is the basilica. This dome-crowned edifice, which with its various annexes took more than a century to build and adorn under the direction of many famous artists, serves merely as the setting of a tiny cottage standing within the basilica itself. Though the rough walls of the little building have been raised in height and are cased externally in richly sculptured marble, the interior measures only thirty-one feet by thirteen. An altar stands at one end beneath a statue, blackened with age, of the Virgin Mother and her Divine Infant. As the inscription, Hic Verbum caro factum est, reminds us, this building is honoured by Christians as the veritable cottage at Nazareth in which the Holy Family lived, and the Word became incarnate. 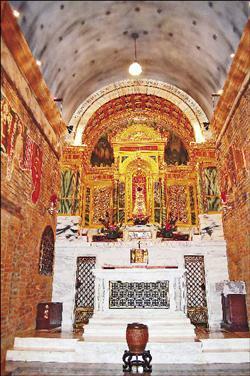 Another inscription of the sixteenth century which decorates the eastern fac,ade of the basilica sets forth at greater length the tradition which makes this shrine so famous. "Christian pilgrim", it says, "you have before your eyes the Holy House of Loreto, venerable throughout the world on account of the Divine mysteries accomplished in it and the glorious miracles herein wrought. It is here that most holy Mary, Mother of God, was born; here that she was saluted by the Angel, here that the eternal Word of God was made Flesh. Angels conveyed this House from Palestine to the town Tersato in Illyria in the year of salvation 1291 in the pontificate of Nicholas IV. Three years later, in the beginning of the pontificate of Boniface VIII, it was carried again by the ministry of angels and placed in a wood near this hill, in the vicinity of Recanati, in the God, it took up its permanent position on this spot three hundred years ago [now, of course, more than 600]. Ever since that time, both the extraordinary nature of the event having called forth the admiring wonder of the neighbouring people and the fame of the miracles wrought in this sanctuary having spread far and wide, this Holy House, whose walls do not rest on any foundation and yet remain solid and uninjured after so many centuries, has been held in reverence by all nations." That the traditions thus boldly proclaimed to the world have been fully sanctioned by the Holy See cannot for a moment remain in doubt. More than forty-seven popes have in various ways rendered honour to the shrine, and an immense number of Bulls and Briefs proclaim without qualification the identity of the Santa Casa di Loreto with the Holy House of Nazareth. As lately as 1894 Leo XIII, in a Brief conceding various spiritual favours for the sixth centenary of the translation of the Santa Casa to Loreto, summed up its history in these words: "The happy House of Nazareth is justly regarded and honoured as one of the most sacred monuments of the Christian Faith; and this is made clear by the many diplomas and acts, gifts and privileges accorded by Our predecessors. No sooner was it, as the annals of the Church bear witness, miraculously translated to Italy and exposed to the veneration of the faithful on the hills of Loreto than it drew to itself the fervent devotion and pious aspiration of all, and as the ages rolled on, it maintained this devotion ever ardent." 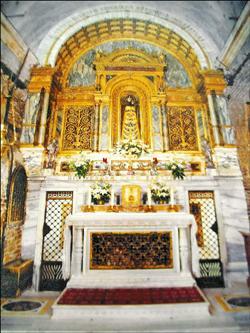 If, then, we would sum up the arguments which sustain the popular belief in this miraculous transference of the Holy House from Palestine to Italy by the hands of angels, we may enumerate the following points: (1) The reiterated approval of the tradition by many different popes from Julius II in 1511 down to the present day. This approval was emphasized liturgically by an insertion in the Roman Martyrologium in 1669 and the concession of a proper Office and Mass in 1699, and it has been ratified by the deep veneration paid to the shrine by such holy men as St. Charles Borromeo, St. Francis de Sales, St. Ignatius Loyola, St. Alphonsus Liguori, and many other servants of God. (2) Loreto has been for centuries the scene of numerous miraculous cures. Even the skeptical Montaigne in 1582 professed himself a believer in the reality of these (Waters, "Journal of Montaigne's Travels", II, 197-207). (3) The stone on which the original walls of the Santa Casa are built and the mortar used in their construction are not such as are known in the neighbourhood of Loreto. But both stone and mortar are, it is alleged, chemically identical with the materials most commonly found in Nazareth. (4) The Santa Casa does not rest and has never rested upon foundations sunk into the earth where it now stands. The point was formally investigated in 1751 under Benedict XIV. What was then found is therefore fully in accord with the tradition of a building transferred bodily from some more primitive site. It must be acknowledged, however, that recent historical criticism has shown that in other directions the Lauretan tradition is beset with difficulties of the gravest kind. These have been skilfully presented in the much-discussed work of Canon Chevalier, "Notre Dame de Lorette" (Paris, 1906). It is possible that the author has in some directions pressed his evidence too far and has perhaps overstated his case, but despite the efforts of such writers as Eschbach, Faloci-Pulignani, Thomas, and Kresser, the substance of his argument remains intact and has as yet found no adequate reply. The general contention of the work may be summarized under five heads: (1) From the accounts left by pilgrims and others it appears that before the time of the first translation (1291) there was no little cottage venerated at Nazareth which could correspond in any satisfactory way with the present Santa Casa at Loreto. So far as there was question at all in Nazareth of the abode in which the Blessed Virgin had lived, what was pointed out to pilgrims was a sort of natural cavern in the rock. (2) Oriental chronicles and similar accounts of pilgrims are absolutely silent as to any change which took place in 1291. There is no word of the disappearance at Nazareth of a shrine formerly held in veneration there. It is not until the sixteenth century that we find among Orientals any hint of a consciousness of their loss and then the idea was suggested from the West. (3) There are charters and other contemporary documents which prove that a church dedicated to the Blessed Virgin already existed at Loreto in the twelfth and thirteenth centuries, that is to say, before the epoch of the supposed translation. (4) When we eliminatecertain documents commonly appealed to as early testimonies to the tradition, but demonstrably spurious, we find that no writer can be shown to have heard of the miraculous translation of the Holy House before 1472, i.e., 180 years after the event is supposed to have taken place. The shrine and church of Loreto are indeed often mentioned; the church is said by Paul II in 1464 to have been miraculously founded, and it is further implied that the statue or image of the Blessed Virgin was brought there by angels, but all this differs widely from details of the later accounts. (5) If the papal confirmations of the Loreto tradition are more closely scrutinized it will be perceived that not only are they relatively late (the first Bull mentioning the translation is that of Julius II in 1507), but that they are at first very guarded in expression, for Julius introduces the clause "ut pie creditur et fama est", while they are obviously dependent upon the extravagant leaflet compiled about 1472 by Teramano. It is clearly impossible to review here at any length the discussions to which Canon Chevalier's book has given rise. As a glance at the appended bibliography will show, the balance of recent Catholic opinion, as represented by the more learned Catholic periodicals, is strongly in his favour. The weight of such arguments as those drawn from the nature of the stone or brick (for even on this point there is no agreement) and the absence of foundations, is hard to estimate. As regards the date at which the translation tradition makes its appearance, much stress has recently been laid by its defenders upon a fresco at Gubbio representing angels carrying a little house, which is assigned by them to about the year 1350 (see Faloci-Pulignani, "La s. Casa di Loreto secondo un affresco di Gubbio", Rome, 1907). Also there are apparently other representations of the same kind for which an early date is claimed (see Monti in "La Scuola Cattolica", Nov. and Dec., 1910). But it is by no means safe to assume that every picture of angels carrying a house must refer to Loreto, while the assigning of dates to such frescoes from internal evidence is one of extreme difficulty. With regard to the papal pronouncements, it is to be remembered that in such decrees which have nothing to do with faith or morals or even with historical facts which can in any way be called dogmatic, theologians have always recognized that there is no intention on the part of the Holy See of defining a truth, or even of placing it outside the sphere of scientific criticism so long as that criticism is respectful and takes due regard of place and season. On the other hand, even if the Loreto tradition be rejected, there is no reason to doubt that the simple faith of those who in all confidence have sought help at this shrine of the Mother of God may often have been rewarded, even miraculously. Further it is quite unnecessary to suppose that any deliberate fraud has found a place in the evolution of this history. There is much to suggest that a sufficient explanation is afforded by the hypothesis that a miracle-working statue or picture of the Madonna was brought from Tersato in Illyria to Loreto by some pious Christians and was then confounded with the ancient rustic chapel in which it was harboured, the veneration formerly given to the statue afterwards passing to the building. Finally, we shall do well to notice that at Walsingham, the principal English shrine of the Blessed Virgin, the legend of "Our Lady's house" (written down about 1465, and consequently earlier than the Loreto translation tradition) supposes that in the time of St. Edward the Confessor a chapel was built at Walsingham, which exactly reproduced the dimensions of the Holy House of Nazareth. When the carpenters could not complete it upon the site that had been chosen, it was transferred and erected by angels' hands at a spot two hundred feet away (see "The Month", Sep., 1901). Curiously enough this spot, like Loreto, was within a short distance of the sea, and Our Lady of Walsingham was known to Erasmus as Diva Parathalassia.